A graphic from the press release outlining the brands now under ownership of PSA. The Opel and Vauxhall logos are at the top left and right of the graphic respectively. Free2Move is PSA's newly formed mobility solutions brand, incorporating car-sharing, leasing and corporate fleet management services. From PSA's point of view, acquiring Opel makes sense as it enables the company to consolidate its market share in Europe. The acquisition not only removes a competitor, but multiplies both the tangible resources available at its disposal, such as factories, human resources (e.g. number of employees), R&D facilities and Intellectual Property (IP), and intangible resources such as the skills, potential ideas and potential for innovation that these new employees bring. The benefits of the sale from General Motors' perspective are apparent from the second slide displayed above. 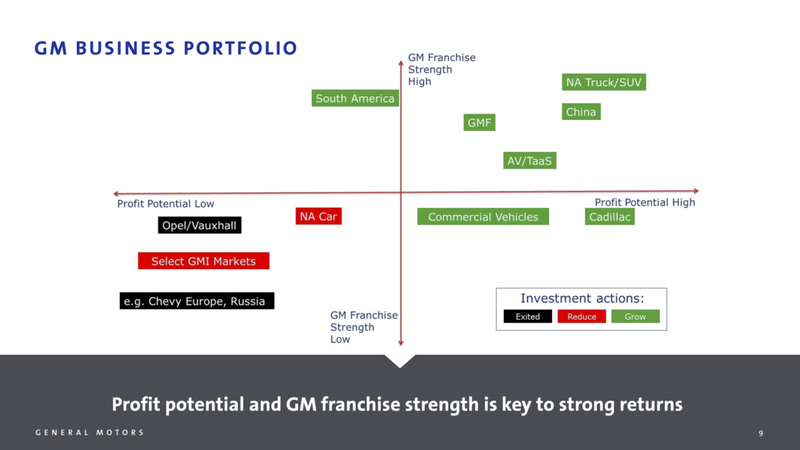 GM's new corporate strategy revolves around two key focuses, namely 'profit potential', (i.e. how much scope the company has to make money) and 'franchise strength' (i.e. how much 'market share' the company has, or how strong the company is, relative to its competitors). In Europe, GM's Opel/Vauxhall subsidiaries were loss making enterprises that were being dominated, in terms of sales and market share, by competitors including Peugeot/Citroën and the Volkswagen Group. Consequently, it was prudent for GM to offload its European business and focus on growing profitable aspects of the GM portfolio such as the truck and SUV market in North America. The most obvious challenge for PSA is to ensure that Opel and Vauxhall do not become a burden for the rest of the company, in a fashion akin to GM. As per the slides depicted above, PSA aims to avoid this issue by creating 'synergies' between its brands. But what exactly does this mean? In corporate-speak, the term synergy refers to products or business plans that are complementary, or act as complementary interpretations built on the same foundation. Previously being competitors, Opel and PSA currently share a number of competing models. One way to increase this synergy is through the practice of platform sharing. This involves a manufacturer developing a fundamental set of components, for example, a chassis, powertrain and suspension design as well as electrical components. These components are then used as a set of common standards across different body-styles. Consequently, this allows the manufacturer to minimise engineering costs and reduce product development times, such that the brand can quickly expand (if needed) and regularly update their range to cover most market segments. Above: The smorgasbord of products offered by the combined PSA and GM brands by market segment. Platforms are colour coded. As evident from the table above, GM and PSA have overlapping products in most segments. Also apparent is the large number of differing platforms used across the various brands. In total, GM and PSA brands use 13 different platforms to cover the automotive market. In order to improve synergy, a key challenge for PSA will be to rationalise these platforms and minimise the use of bespoke architectures. In an ideal situation, a platform would be engineered that is versatile enough to underpin vehicles ranging from light cars to large SUVs, whilst also being cost-efficient enough to ensure that all models developed on such a platform remain profitable. On the face of it, using an older platform saves PSA money by cutting the per-vehicle development cost. Additionally, by being a known quantity, it maximises the vehicle's reliability and minimises the likelihood that the model will suffer from a major product recall or other failure. In turn, this presumption of greater reliability comes with the tradeoff of a lower potential to improve the car. Re-using the same basic architecture for the next generation of a particular model inherently limits the advancements that engineers and designers can make in areas such as driving dynamics, performance and technology. Amongst other benefits, widespread platform sharing offers a way to maintain the presumed reliability of using an older platform, whilst also delivering greater overall cost benefits and removing the development limitations that are part and parcel of reusing an old platform. Whilst developing a well-engineered, versatile platform incorporating the latest technologies may have a high initial cost, using this architecture across the model range delivers economies of scale. These economies of scale can reduce the overall cost of developing or revamping a vehicle range. By having an already developed fundamental architecture, per-model engineering costs can be reduced, and other savings could be realised in production costs, with the possibility of shared tooling and production lines for different body styles. Moreover, incorporating a rigorously engineered and test platform as a starting point will minimise reliability and product failure concerns. With an older, less developed platform, reliability is generated through the experience of gradually tweaking a platform to account for issues or failures during its life-cycle. In contrast, a platform that is rigorously engineered to accomodate a range of vehicles from the outset will be more reliable by design, in having undergone a more exhaustive initial development process. There are also significant dividends in terms of performance and technological parity amongst different models in a manufacturer's fleet. By adopting a uniform platform, the manufacturer can ensure that different vehicles share similar driving and refinement characteristics, whilst also being able to offer similar levels of technology and other features despite size and body style differences. An example of the synergies achieved through platform sharing can be found in the Volkswagen Group's use of the MQB platform for their mainstream product lineup. 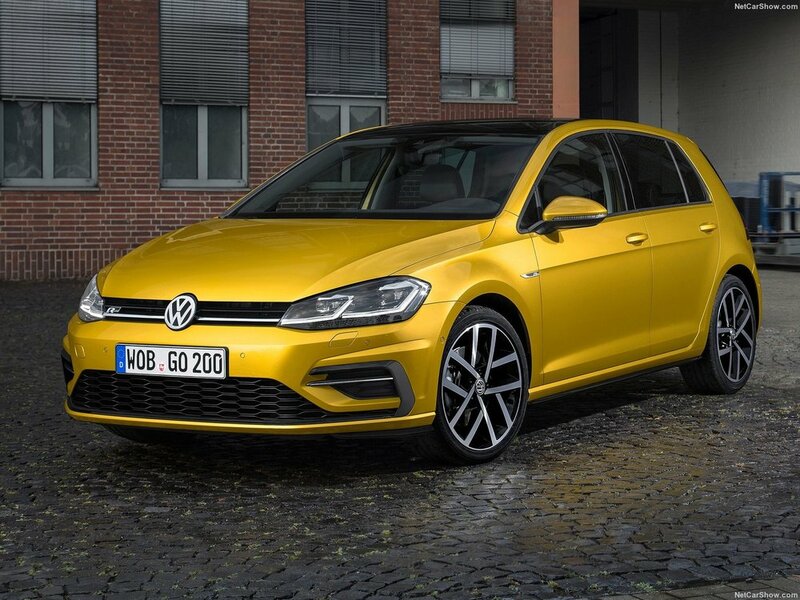 Clockwise from top left in increasing order of size: The 2018 Seat Ibiza, 2017 VW Golf, 2015 VW Passat and 2018 VW Atlas. The models depicted above, from the light car Ibiza to the Atlas large SUV, all share the versatile MQB platform, and thus share similar in-car technologies, driving characteristics and refinement levels. 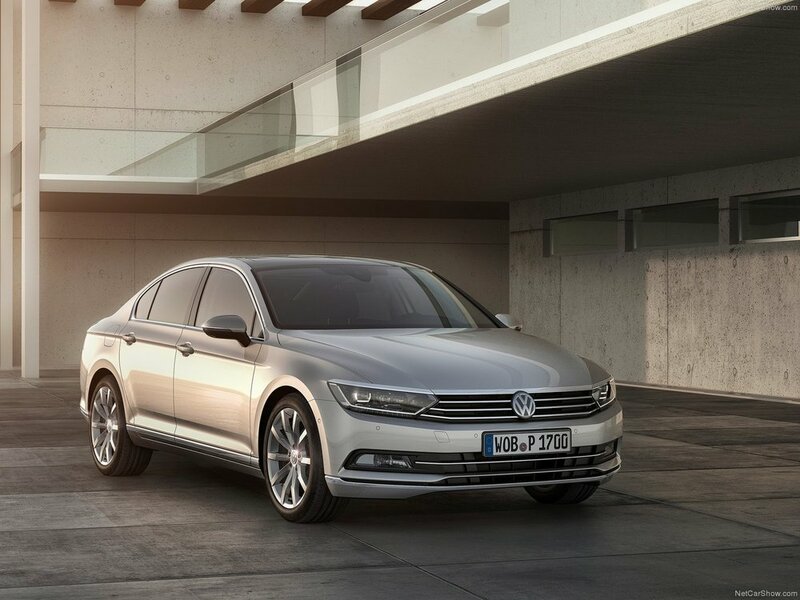 Note that whilst the VW brand is often derided for its bland, derivative styling, this is due to the work of the exterior stylists and designers rather than any inherent shortcoming with the practice of platform sharing or the MQB platform in general. From a financial perspective, VW's MQB platform also appears to provide significant savings in areas such as engineering costs. Thus, PSA is also likely to realise similar benefits if it can adopt platform-sharing across its German and French brands through the creation of a universal platform. Fundamentally, customers don't want a German car or a French car. They want a great car. A prospective customer doesn't purchase a Porsche because it is a German brand, they purchase it due to its performance and quality. Likewise, a Volvo isn't bought because of its Swedish origins, it is purchased because of its commitment to honest design and renowned safety features. The notion that German engineering, and thus cars from German brands, are inherently better than their peers is an illusion resulting from the German automotive industry's collective desire to focus on the premium end of the automotive market. There is little value in marketing a car as French or German without it also having the requisite performance, features and quality desired by the target market. In this sense, it is important to distinguish the often fine line between differentiation for differentiation's sake, and differentiation that actually improves the product. Before PSA can differentiate its French brands and Opel, it must ensure that the vehicle fundamentally is great. Once this initial standard has been established, PSA can then embark on endowing its brands with different flavours as a form of differentiation that improves the brand. 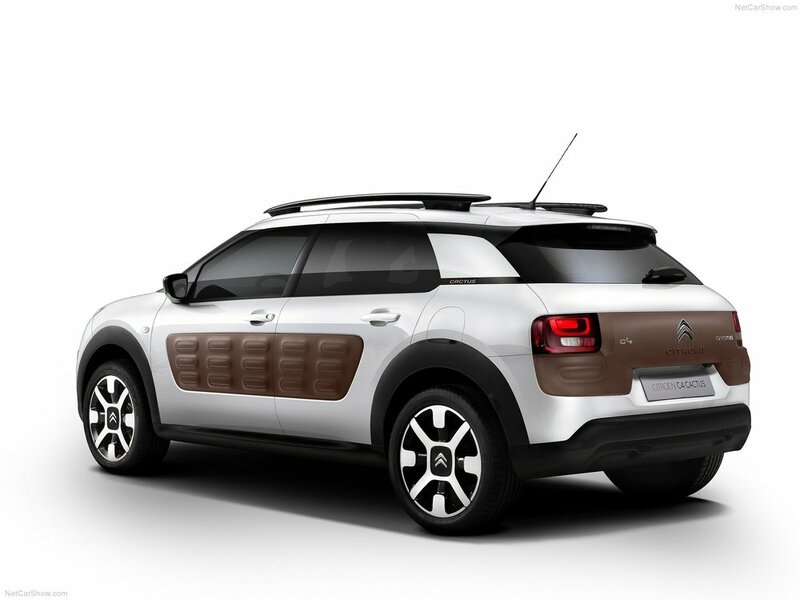 The presence of a particular feature, performance or quality characteristic cannot be justified solely due to the car being "French" or "German"; it must have a higher purpose in terms of actually improving the product. Product cannibalisation is the fear that offering a new, or differentiated, product in the market will take away from sales of an existing product, instead of compounding total sales. With PSA now selling Opel models competitive with its own French brands, there is the fear that rather than the company's market share multiplying, it will stagnate as the two brands take sales away from each other. Ultimately, this fear is groundless. Even if there is product cannibalisation, it is a near certainty that the combined ownership of Opel and existing French brands will give PSA better sales than selling Peugeot, Citroen and DS only. This in itself will be a significant improvement. The greater risk, in fact, is that the PSA Group artificially limits the quality or performance of a particular brand in a deliberate attempt to avoid cannibalisation. Rather, product cannibalisation should be encouraged, in the sense that PSA should allow each brand to make the best product that it possibly can (whilst remaining true to its brand identity). The best products are developed through fierce, but healthy, competition, and it is beneficial to PSA for this competition to also originate internally rather than only through external, non-PSA brands. As per the business philosophy of a famous electronics company, if the ultimate goal is to create the best product, cannibalisation is an irrelevant and insignificant concern. In a financial sense, General Motors' decision to sell Opel clearly makes sense. The company's new plan to focus on strong businesses with high profitability is a step change from its past desires to dominate the automotive industry by building 'a car for every purse and purpose.' Focusing instead on profitability should ensure that GM is a sustainable, well-run business that is safeguarded from bankruptcy in the event of future GFC style economic calamities. What is also crucial to take into account is the intangible potential lost by the transfer of employees to the PSA Group. Opel employees were responsible for key developments in the GM group, such as bringing matrix headlamps into the mainstream with its IntelliLux technology, launching the CarUnity car sharing initiative and developing platforms that were used for small cars sold under various GM brands around the world. Whilst it is impossible to predict what innovations this group might develop in the future, precedent suggests that GM may have lost a talented group of engineers, designers and other business professionals. With Opel being a loss-maker for GM, the company evidently feels that Europe is not a market in which it can profitably participate in. Nevertheless, business environments change constantly. The transfer of local employees and expertise, along with factories, may hamper any future effort to re-enter the European market. Whilst GM will maintain a rump presence in Europe by continuing to sell Cadillac vehicles and the Chevrolet Camaro and Corvette, such limited sales operations of niche products are unlikely to be of much benefit if GM wishes to become a major participant in the European market and again exploit the region's manufacturing, designing and engineering expertise. It is clear that whilst PSA's acquisition of GM's European operations has significant benefits, there are numerous risks for both parties as well. The key challenge for PSA will be to effectively manage its new acquisition. Crucially, the potential synergies offered through platform-sharing must be taken advantage of, whilst inter-brand competition should not be artificially restricted. From GM's perspective, whilst this move is in line with its focus on profitability, any future re-entry into the European market may be hampered by this loss of local expertise and resources.